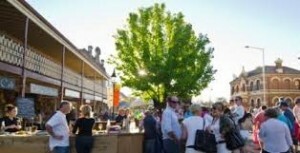 Mudgee over the years has evolved to being a very cosmopolitan and multicultural town. In the last few years due to the strength in the tourist industry as well as the mining industry Mudgee has enjoyed an incredible growth surge, both in population and in its basic services. Mudgee now can boast to having some of the best known chain stores and supermarkets in Australia. It also has some of the finest restaurants in the entire area, with well renowned chefs that have won many awards for their fine cuisine. Coupled with that a large variety of locally owned boutique style gift shops, fashion shops and craft shops that would make a visit to Mudgee for those who like to enjoy that little retail therapy in a very relaxed atmosphere where a park is easy to obtain and friendly people are in abundance a very enjoyable experience. When it comes to supermarkets then I think we have all options covered. First there is Aldi which is located very close to the CBD at 97 church Street, then there is Coles supermarket located in the very heart of the town in Mortimer Street and last of all we have Woolworths which is located at 88 Mortimer Street. All are within easy access of the general business area and have ample parking. Big W and Target are our larger department style stores and both of these are also located with ample parking close to the business hub. As you come into town from main entrance from Sydney, you will pass Harvey Norman on your right on the very edge of town and Sleep City on your left. As you wind your way into the heart of the Mudgee Township will pass many businesses that provide services to the local coal mines and farmers in the area. Mudgee is well catered for with all of it’s agricultural needs as there are many large farms and vineyards producing top-quality top quality produce right throughout the entire Gulgong & Mudgee areas. The Mudgee farmers markets which are held on the third Saturday of every month are a great place to sample some of this local produce. They are held regardless of the weather and the time of the year and will always offer a large range of locally produced seasonal products. They offer both visitors and locals a great opportunity to meet and taste some of the great products on offer as well as a chance to listen to some music and browse through a great variety of stalls. For more information please visit their website, http://mudgeefinefoods.com.au/farmers-market. From health food to hotels, from saddlery to sportsware, whatever your shopping needs they can be met in Mudgee with a minimum of fuss and in a relaxed care free atmosphere. Most shops open late night Thursday night and all will be open until 1 PM on a Saturday. Most of the shops in the main street as well is all the larger chain type stores open seven days a week. The supermarkets all open till late. So in summary if you are planning a trip to Mudgee and think that you are going to perhaps miss out on some of the shopping opportunities that may be available in a bigger centre, than you might be pleasantly surprised at the variety of shops on offer within the Mudgee area. You may find that we have something a little different that may not be on offer in your local area. One thing however you will be guaranteed is a smile and to be made feel very welcome.